In July, we spoke at two senior communities in Fredericksburg – The Crossings and the Chancellor–both great meetings because the residents were truly interested in how two older women (a mother/daughter team no less!) finally got around to fulfilling a dream. We didn’t sell many books at those meetings and didn’t expect to—we were there to pump ourselves up and remember how great being an author can be. This week, however, we tried our first book store event. We’ve been hesitant to jump into that circuit because the store has to take a cut so we’re lucky to break even. 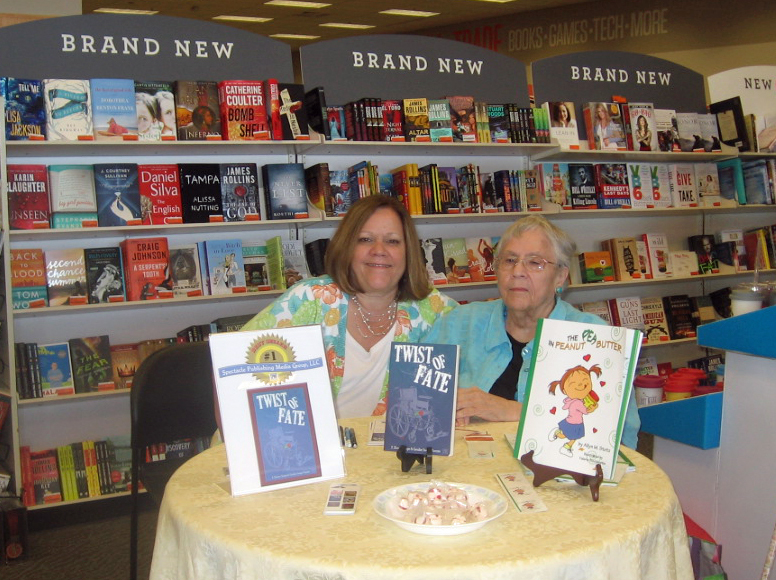 I think we also both visualized a situation similar to the library book signings we’ve done: sitting at a table with just a sign and a smile and watching people go by without looking our way. People at the library do not expect or want to see someone trying to sell them a product—even if it’s a book! Last Saturday, we set up a table at 2nd and Charles, a huge used book (as well as used movies, instruments, albums) store, put on those smiles and put up the sign. But instead of being ignored, people stopped; people talked; some people bought—shoppers of all ages and types kept pouring through that front door and walking by the table. It was delightful so many people paused to meet the authors and exclaim over our fortune and fortitude in getting our books into print. The staff at 2nd and Charles bent over backwards to make us feel comfortable and appreciated. And we sold more books than we’ve sold at any recent event. However, what made us smile as we packed our materials away was something entirely different: we realized that the constant stream of traffic meant there are many many readers out there. Despite the 3D Imax glitter of movies, the 100-plus channels most people have on their televisions, the graphic fantasy worlds of computer and Xbox games, those who shop at 2nd and Charles choose to hold a book in their hands and let their minds do the work. Of course it made us smile: they are our audience and this is our curtain call. Good for you guys! When I have book signings at B&N, I might not sell that many, but there is always a lot of traffic. Books will never die! Thank god for that. The sign looks good! Don’t forget to post this on Facebook so I can share it with my friend! Great photo of you two. How’d the empty nesters do this weekend?